Summary : This tea from the Dragonwater Tea Company (now out of business) is a nice mixture of apple pieces and vanilla flavoring. I found the vanilla taste to be on the weak side a bit, but this was compensated by the very "fruity" taste of this tea...which I rather liked. Review : Quite simply, I'm a vanilla junkie. I'll try anything with vanilla in it, sooner or later. This is especially in regards to tea. You see, I'm on a quest to find the perfect "Vanilla Ice Cream" replacement. If I could find that perfect replacement in a tea, I would indeed be a very happy camper, as I could enjoy the lovely taste of vanilla ice cream without the calories! A match indeed made in heaven. But despite trying countless vanilla teas, I've yet to even come close to finding that ideal vanilla ice cream replacement. Inevitably, the vanilla tastes, well, like vanilla. But doesn't resemble ice cream in the least due to all the other stuff...notably cream...that goes into making ice cream. For this reason, in my last order with the Dragonwater Tea Company (now out of business) I couldn't resist ordering a tea labelled Vanilla Cream. Yes, just perhaps, this could be the ice cream replacement I so desperately seek. Vanilla + Cream = Ice Cream, right? Well, not exactly, as I was about to discover. The Vanilla Cream Tea from Dragonwater Tea Company (now out of business) contains the following ingredients : Fruit melange with hibiscus, apple pieces, rose hips, bourbon vanilla, and a vanilla-cream flavor. The problem arose, of course, when I actually opened up the tea. It smelled nice. And it looked even nicer. The problem was that I discovered that this tea is essentially a fruit tea - consisting of massive fruit pieces! Almost immediatley, my heart sank a bit since there was no way I was going to find a vanilla ice cream replacement in a fruit herbal tea! And my suspicions proved correct. This tea, once brewed, is a beautiful ruby-red color. And when the moment comes to taste the tea, it tastes like, you guessed it...a fruity tea, with a very strong taste of apples in particular. Hey, I love apples, don't get me wrong. It just wasn't what I was expecting. Oh well, it just goes to show me that I should probably read the list of ingredients in the tea before buying it. So, what about the vanilla taste. Well, the taste of vanilla is there...but it is awfully faint, although I did notice rather oddly that on some sips you could taste the vanilla rather strongly...and on other sips you would get no vanilla flavor whatsoever. I suspect the vanilla flavor just gets generally overpowered by the overwhelmingly "fruity taste" of this tea, only occasionally rising to the occasion to be noticeable to the taste buds. This may even be a good thing, as I wasn't especially pleased with the flavor of the tea when the taste of vanilla raised it's head to be noticed. Overall, if you are searching for a good vanilla tea, I can't in good conscience recommend this one. Really, this is a FRUIT TEA, not a vanilla tea. The vanilla cream flavor is just, well, "sort of there" and isn't anything special. Indeed, in some ways I found the vanilla flavoring sort of detracted from the rather pleasant fruity taste the tea had. Recommendation : Yes. 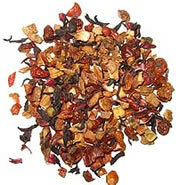 If you enjoy fruity herbal teas, then this tea has your name on it. The flavor of this tea is a strong fruit tea, with an occasional "hit" of vanilla that to me at least sort of tasted kind of bad. But that's just me - you may like the "vanilla hit" a bit more than me. Brewing Instructions : Use one teaspoon (or a bit more) of tea leaves. Pour 1 cup (5.5 ounces, but 6 works quite nicely) boiling water over the leaves. Let the tea brew for 3-5 minutes.